The reviewers received copies of the book from the publisher. We are pleased to take part in The Family Romanov Blog Tour. Be sure to enter the giveaway at the bottom of the post for a chance to win a copy of the book. 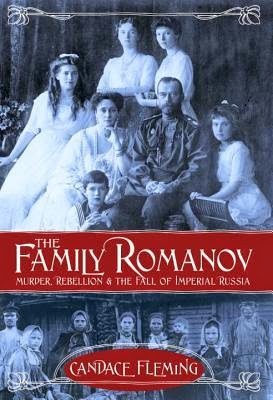 The fate of the Romanovs, the last ruling monarchy in Russia, has been the subject of many books and movies. People hoped the Grand Duchess Anastasia had escaped the bloody massacre that befell the rest of her family: Tsar Nicholas II & Empress Alexandra, sisters Olga, Tatiana and Marie, and brother Alexi. But by 2007, the skeletal remains of all family members had been unearthed, thus putting the “Anastasia-is-still-alive” myth to rest. In this comprehensive history by award-winning author Candace Fleming, readers will get an intimate look at the Romanov family and how their indifference to the needs of their people led to the workers’ strikes of 1905 and to Lenin’s rise to power in November 1915. Using sidebars throughout the book, Fleming inserts personal stories of the men and women who wished for a better life and how the Tsar’s lack of concern, in the end, would affect the lives of the Romanov family. As a child and into adulthood, I was obsessed with the fate of Grand Duchess Anastasia. I wanted to believe she alone survived while other family members perished. Questions I often pondered: why was her family executed? Was Tsar Nicholas really indifferent to the needs of his people? And…who exactly was Rasputin? Was he the evil and manipulating man some made him out to be? Breathtaking in its scope, Fleming does an excellent job weaving in the answers to these questions and more. What is different from her previous titles (Amelia Lost: the life and disappearance of Amelia Earhart and The Lincoln's: a scrapbook look at Abraham and Mary) is the book’s overall design. The Family Romanov resembles a traditional nonfiction book where the text is uninterrupted and photos are grouped together on glossy paper and placed in the middle of the book. It works really well here because there is so much depth in what Fleming is covering. From the first chapter, I felt like I had been transported to turn of the century Russia. Fleming hooks readers by describing what it was like to attend a ball at the Winter Palace of the royal family and then contrasts it with the story of the impoverished Russian peasants. Fleming's captivating writing style, impeccable research and use of quotes made this a book I couldn't put down. Fleming paints a complex portrait of the Romanovs, which caused me to feel a range of emotions as I read. At times I was infuriated by their luxurious lifestyle while the majority of Russians suffered in poverty, yet other times I felt pity for the family. Nicholas and Alexandra were out of touch and intimidated by the outside world, they sheltered their children, and desperately tried to keep their ill son in good health. As I read the story of the Romanovs, their strange relationship with Rasputin, the plight of the factory workers & peasants and the rise of the Communist Party, I wished I had this book when I was required to read Animal Farm as a high school sophomore. Visit Candace Fleming's blog for more information about how she researched and chose the photographs for the book, how she worked from two calendar systems (Julian and Gregorian), and more. We are giving away one copy of The Family Romanov. Entries will be accepted until 11:59 p.m. on August 1, 2014.